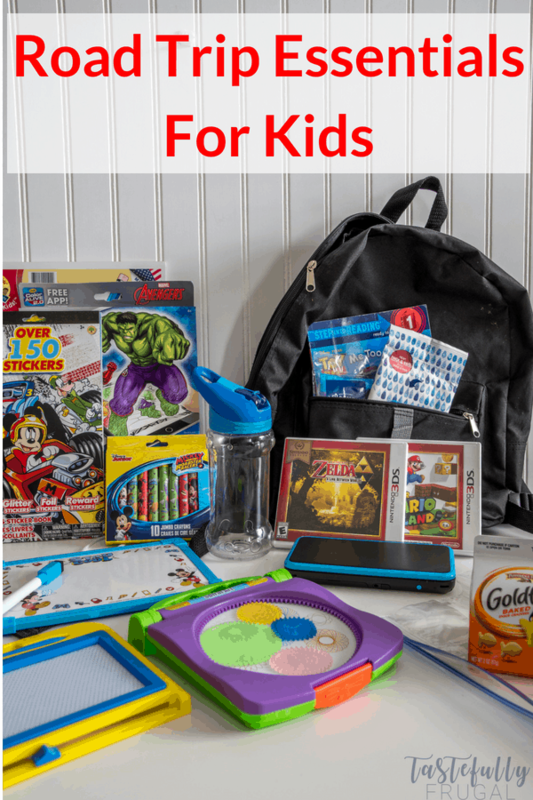 If you have a summer road trip planned with the kids, these road trip essentials make long car rides more enjoyable for everyone. 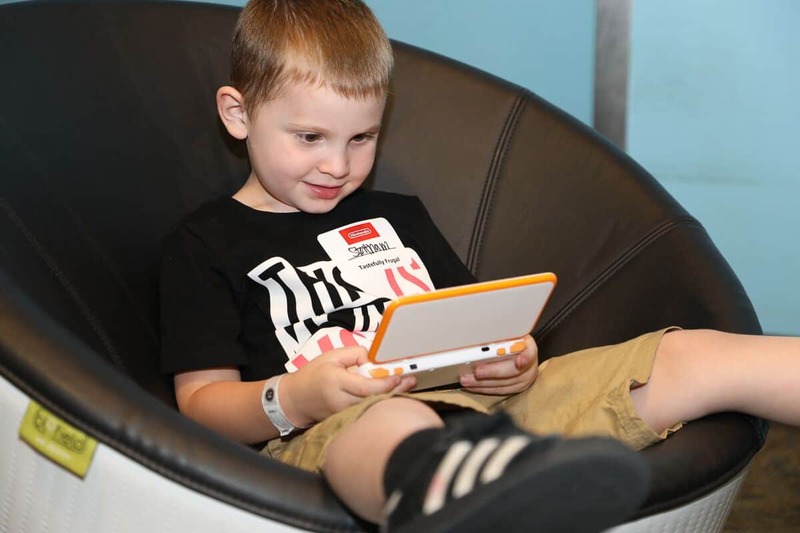 We were invited to a Nintendo event and received a Nintendo gift bag including the new Nintendo 2DS XL earlier this month. All thoughts and opinions are mine alone. If you have ever traveled long distances with kids, you know the struggle is real with keeping everyone happy. Whether it’s the frequent ‘Are we there yet?’ or ‘I’m hungry.’ if you don’t prepare ahead of time, a nice long car ride can become a major headache in no time. 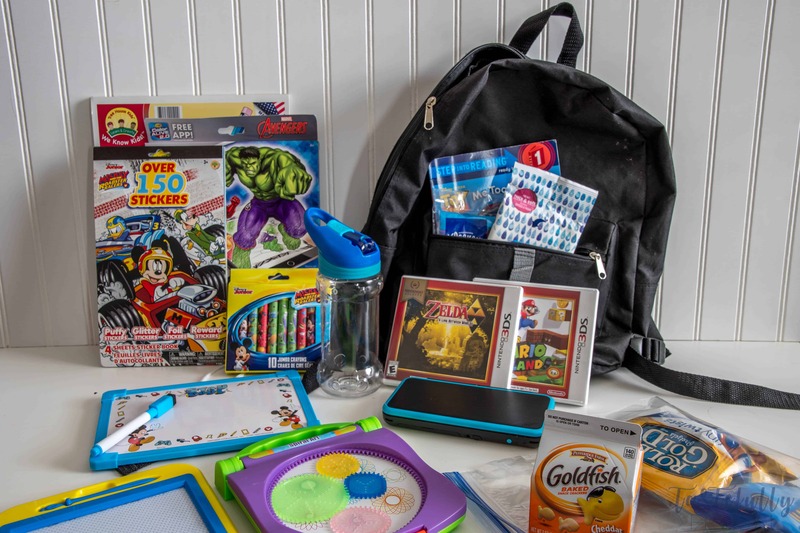 Keep reading to get lots of ideas of what you can pack for kids to keep them happy for the whole car ride. It may look like a little overwhelming but we got everything we need to keep the kids happy at Walmart or the dollar store. Let’s dive in! Planning the food you need/want for your road trip is a huge money saver! You can often buy big packs of cookies and chips for the same price at Walmart or the grocery store that you would pay for a few single serve bags at the gas station. I like to buy the big boxes of chips and cookies ahead of time on Amazon (they are usually less expensive) and will give each kid a bag of chips or pretzels, cookies and a goldfish. I’ll hide the rest in the back of the car so they can’t see it and want more as soon as they finish their first bag AND so I can refill their snack bags and lunch boxes when we stop and get gas. I also include one treat (usually ring pops or a tootsie pop) for only part of the trip (usually the longest section of our trip) and I put everything in a gallon size ziploc bag so they have a place to put their garbage when they are done. 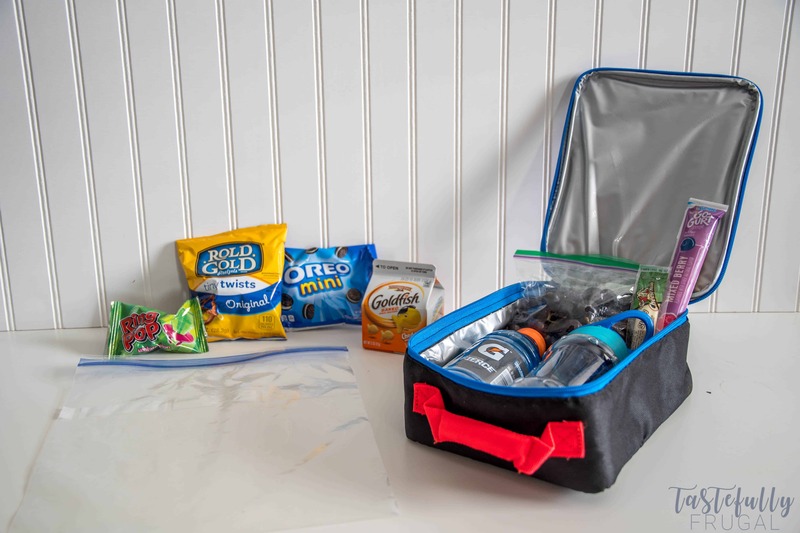 I pack a lunchbox in the kids’ backpacks for other treats like Gogurt, string cheese and grapes (PS frozen grapes are a great treat and a perfect way to stay cool in the hot summer heat). I also pack a small bottle of Gatorade or Powerade and a water bottle. Just like the big box of chips and cookies, I’ll pack a cooler in the back with extra drinks and treats that I can fill up when we stop. Packing a few things in the small pocket of the backpack will make keeping the kids clean(ish) a lot easier. I found these travel size Kleenex wipes and tissues at the Dollar Tree and the mini hand sanitizers come in a pack of 3 for just $1. I also like to pack small books in the front pocket too! 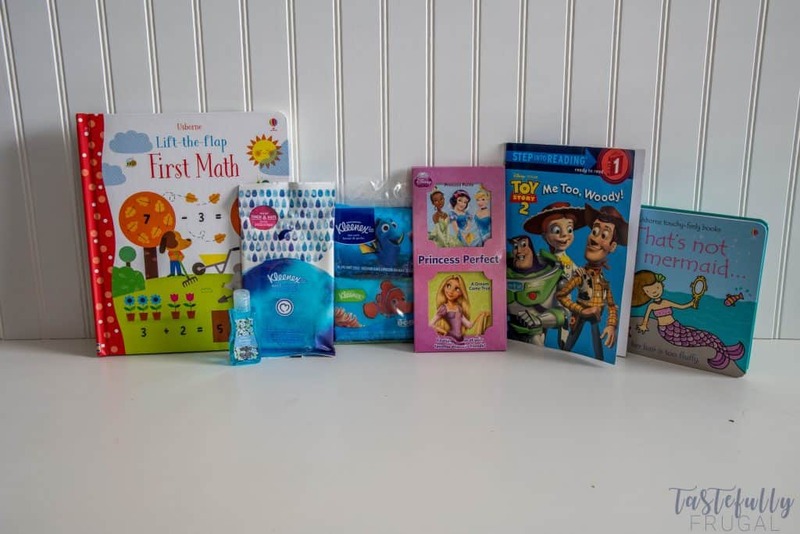 I got these mini princess board books and these ready to read books for $1 at Dollar Tree and my kids love them. We also love activity books (like lift the flap or touch and feel books). Usbourne Books has a great selection of these type of books. This is one of the kids favorite parts. I like to go to the dollar store and get most of our activities. Dollar Tree has an awesome selection of quality coloring books, note books and character themed toys. 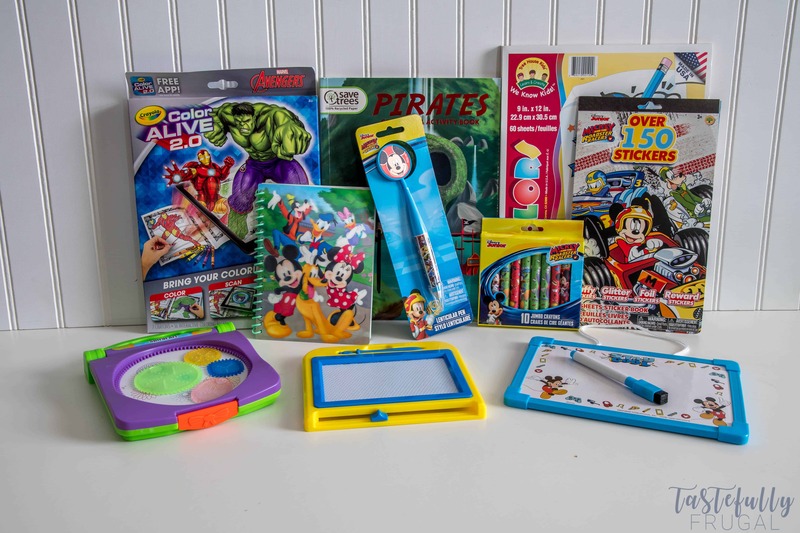 They have Color Alive coloring books which the kids love (and they come with crayons), coloring books and jumbo crayons with Disney characters on them. I also get them a scratch pad to color/draw on, a little notebook and pen to take notes and a dry erase board and marker because kids love them. These mini etch a sketch are a fun quiet activity too! And the spirograph keep my 5 and 6 year old entertained for atleast 30 minutes at a time. Stickers are always fun too and they can stick them to the notes they write each other (or mom and dad). My kids (and to be honest mine too) favorite activity is the Nintendo 2DS XL. It’s really lightweight making it a great option for younger kids as well as older kids. 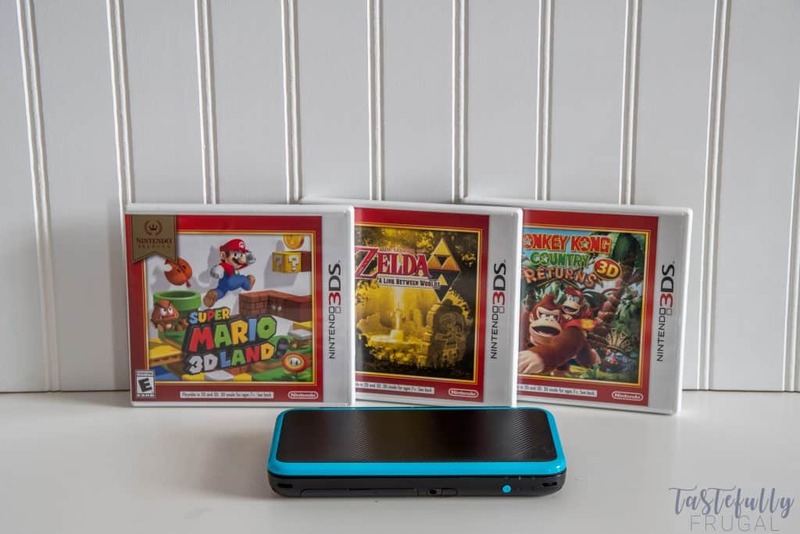 You can buy games (the Nintendo 3DS games work on the 2DS XL) or you can download games in the Nintendo eShop. You don’t have to worry about the kids buying a ton of games without your permission, you can set parental controls limiting the things they can see/buy. Some of the games offer multi player options, allowing the kids to play against each other on your trip. Not only is it a gaming system but the kids can also watch Netflix and browse the web (or mom and dad can when the kids are sleeping)! My boys are 5 and 6 and have loved the Nintendo 2DS XL. My husband really likes it too. The large touchscreens make the games easy to see and there are a ton of game options, including classics and new spins on classics. 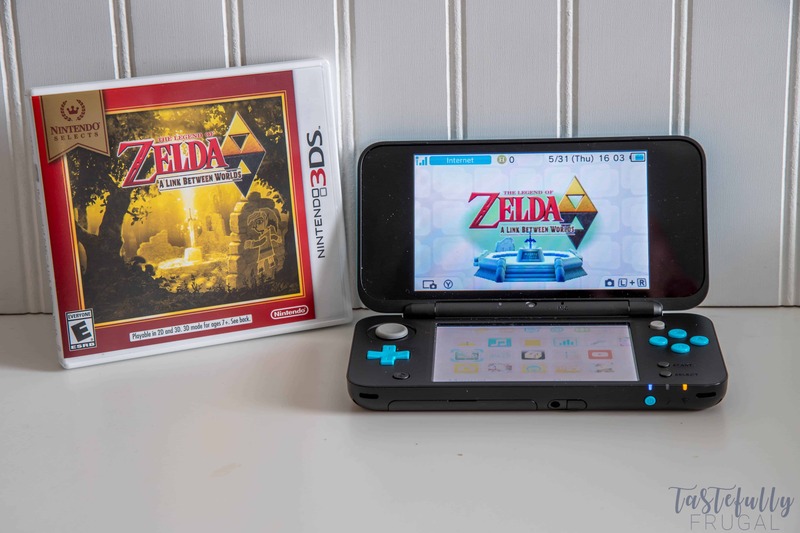 Zelda: A Link Between Worlds is my husbands favorites. He loved the original game and this game resembles it but it allows you to jump back and forth between worlds. My boys really love MarioKart 7, Super Mario 3D Land and Donkey Kong Country Returns. All three games are easy enough for younger kids to play but fun for older kids too (just ask my 13 year old nephew)! I was always one of those moms that said I never wanted my kids to play video games, but I’ve learned sometimes a little game time is good. Especially when I have work that needs to get done or long car rides. Let’s be honest, having your kids play a video game is much better than having to hear ‘I’m bored’ every 15 minutes for 8 hours in a car. Next week I’ll be sharing a comparison of all the gaming consoles my kids have played (at our house and friends’ houses or the store) and what my thoughts are on all of them. So there you have it; everything you need to keep your kids happy and entertained on your road trip. These are things that we’ve packed for smaller trips (a few hours) and longer trips (8+ hours) and it keeps them busy and happy the whole time – except when they’re napping! What are some of your kids favorite things to have during road trips? Let me know in the comments. Great ideas! We’re going on 2 major road trips this summer with lots of car time. I’ll be turning to these ideas when we head out. How fun?! Road Trips are one of my fave things to do with my family too! A really great article. I also find origami a great toy for travels. It is not only engaging, and artistic, but it help really help to induce calmness. ashish bist recently posted…44 Critically-acclaimed Award winning toys for 3 year olds! Thanks for the recommendation Ashish! I’ll have to look into that for my boys!! Thanks a lot for sharing all these great ideas. When ever I travel with my kids it’s always a challenge to keep them entertained. Sometimes a video game can keep them occupied for hours, while other times I have to be more creative. I will definitely give some of your ideas a try the next time we travel.